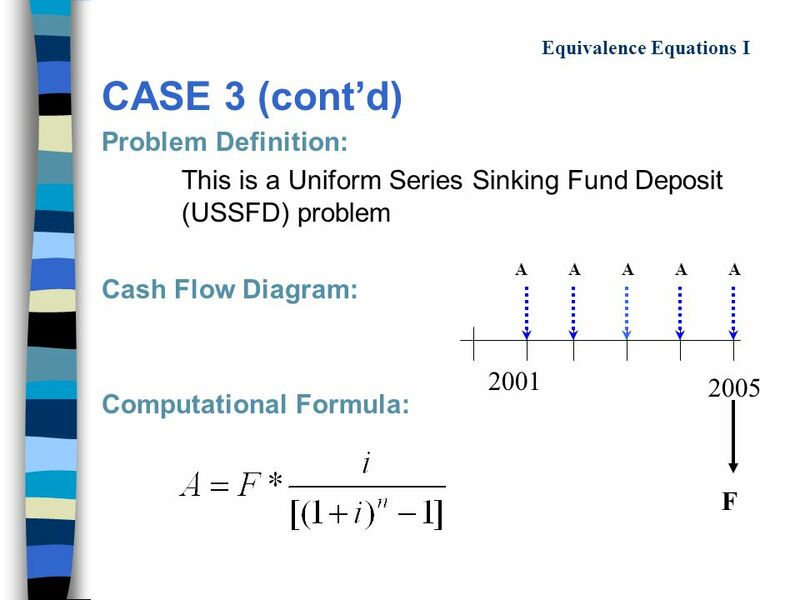 Economic Analysis (cont’d) Last Lecture: Cash Flow Illustrations The Concept of Interest The 5 Variables Equivalence Equations I: Case 1. 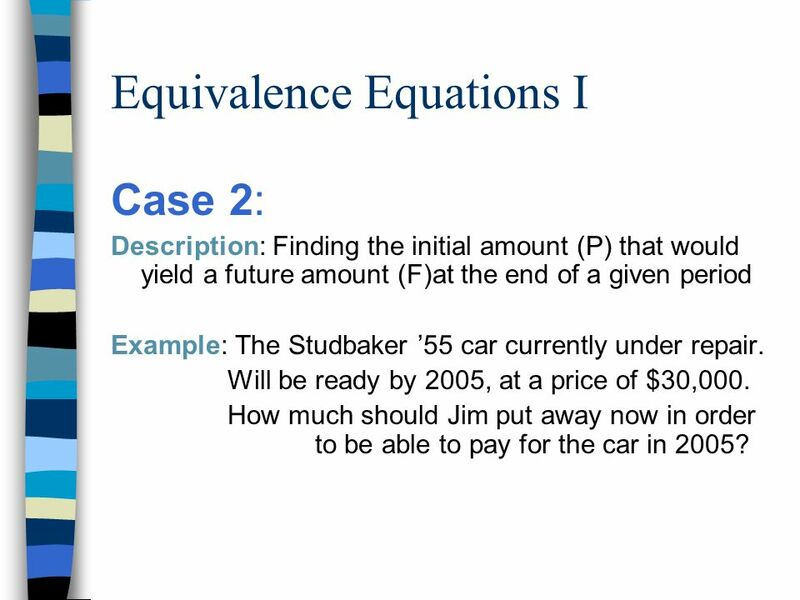 3 Equivalence Equations I Case 2: Description: Finding the initial amount (P) that would yield a future amount (F)at the end of a given period Example: The Studbaker ’55 car currently under repair. Will be ready by 2005, at a price of $30,000. 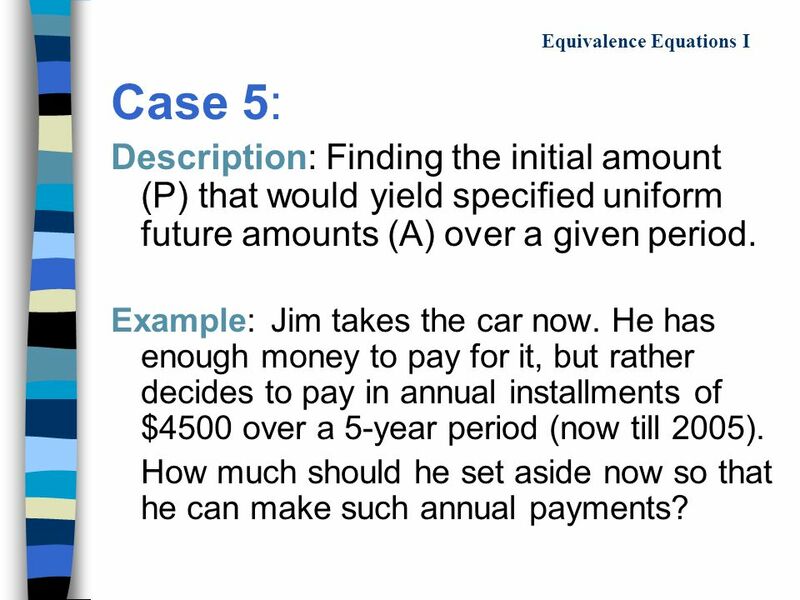 How much should Jim put away now in order to be able to pay for the car in 2005? 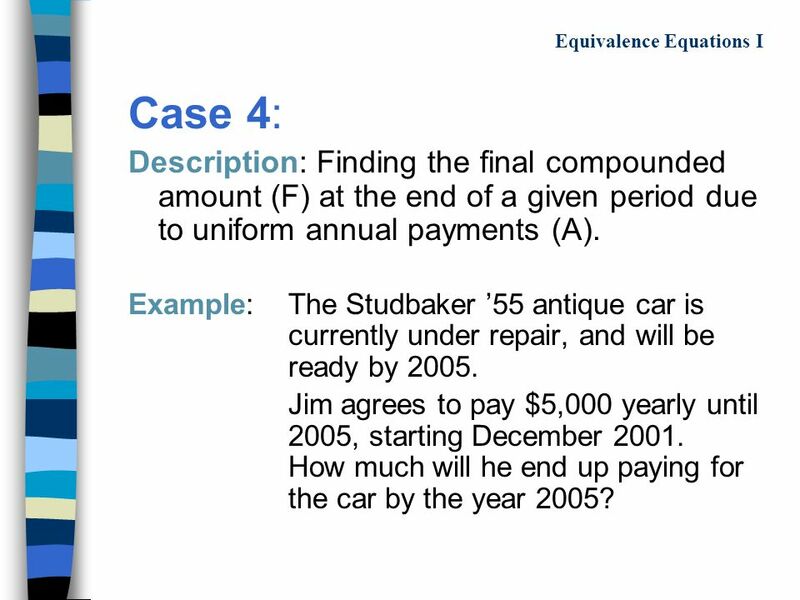 5 Equivalence Equations I Case 3: Description: Finding the amount of uniform annual payments (A) that would yield a certain future amount (F)at the end of a given period Example: The Studbaker ’55 antique car is currently under repair. Will be ready by 2005, at a price of $30,000. Jim agrees to pay 5 yearly amounts until 2005, starting December 2001. How much should he pay every year? 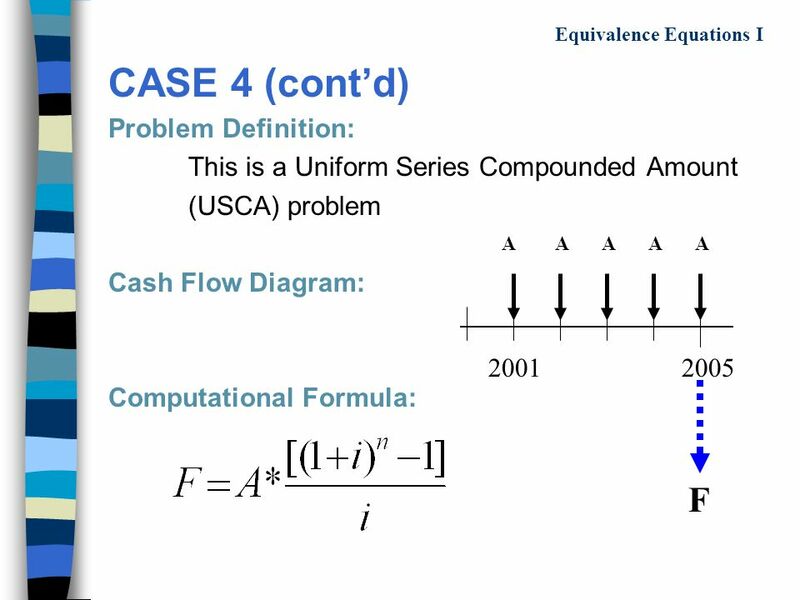 7 Equivalence Equations I Case 4: Description: Finding the final compounded amount (F) at the end of a given period due to uniform annual payments (A). Example: The Studbaker ’55 antique car is currently under repair, and will be ready by 2005. Jim agrees to pay $5,000 yearly until 2005, starting December 2001. How much will he end up paying for the car by the year 2005? 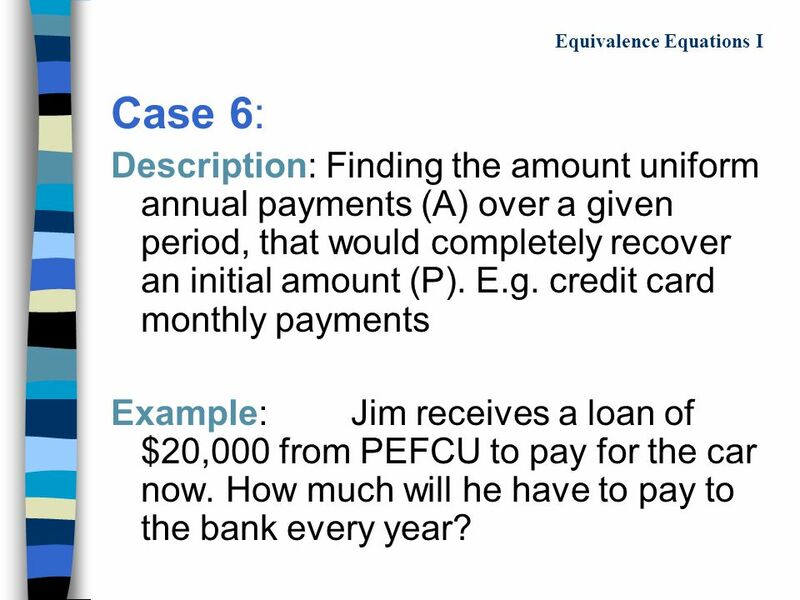 11 Equivalence Equations I Case 6: Description: Finding the amount uniform annual payments (A) over a given period, that would completely recover an initial amount (P). E.g. credit card monthly payments Example: Jim receives a loan of $20,000 from PEFCU to pay for the car now. How much will he have to pay to the bank every year? 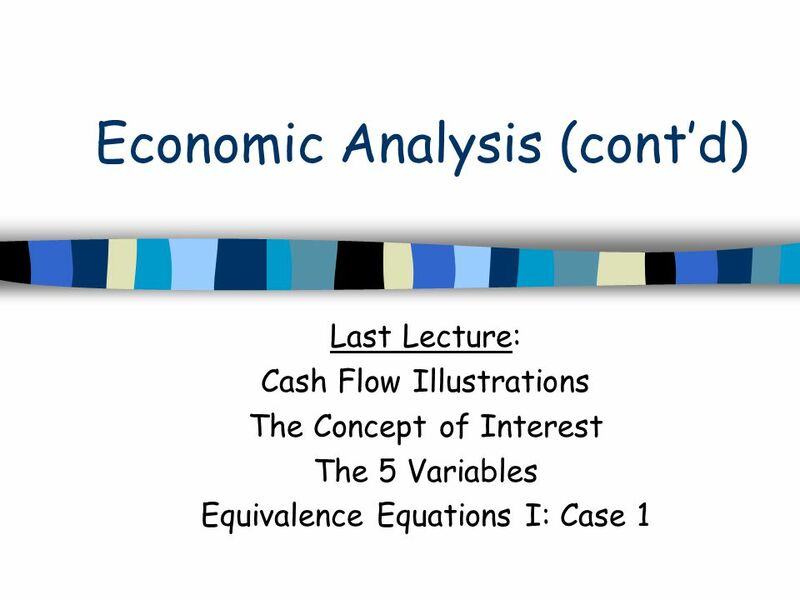 Download ppt "Economic Analysis (cont’d) Last Lecture: Cash Flow Illustrations The Concept of Interest The 5 Variables Equivalence Equations I: Case 1." 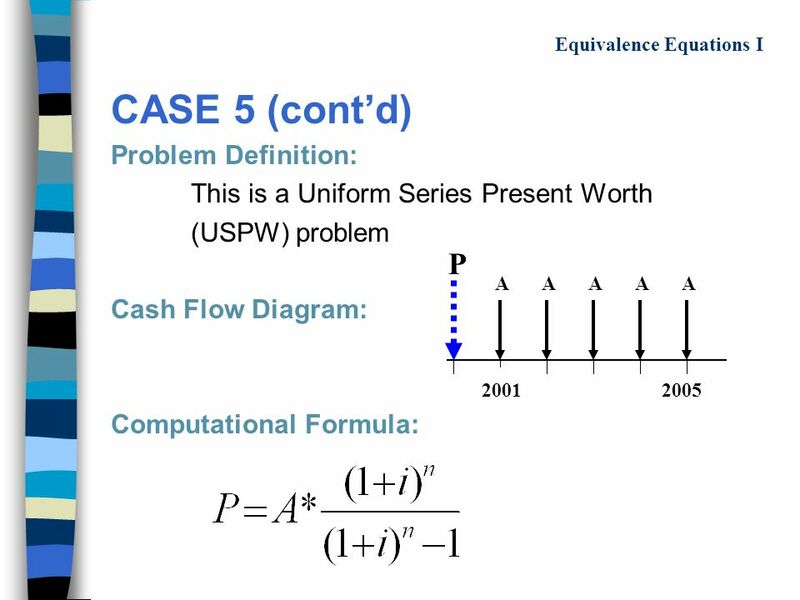 MER439- Design of Thermal Fluid Systems Engineering Economics Lecture 2- Using Factors Professor Anderson Spring 2012. Systems Eng. Lecture 2 Begin Reading Chapter , Problems 1, 3, 5 by Wednesday, January 24, 2001. 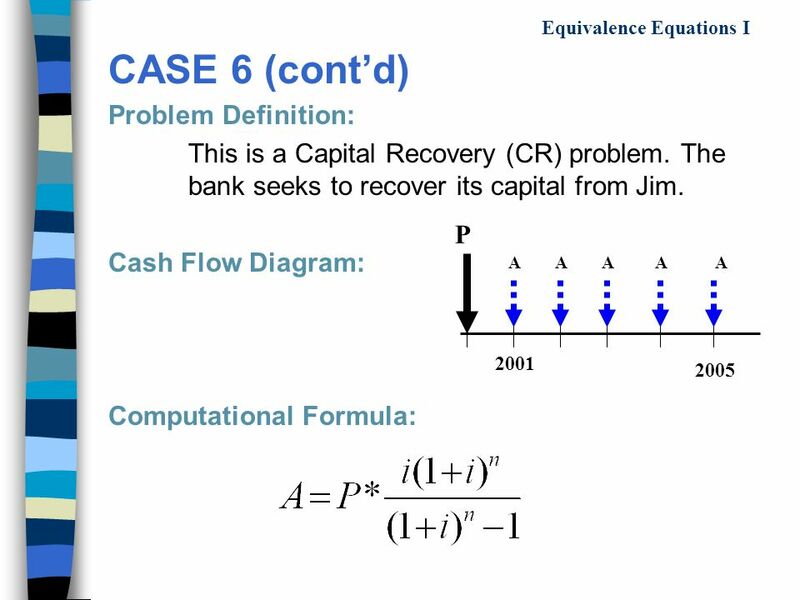 1 Warm-Up Review Homepage Rule of 72 Single Sum Compounding Annuities. 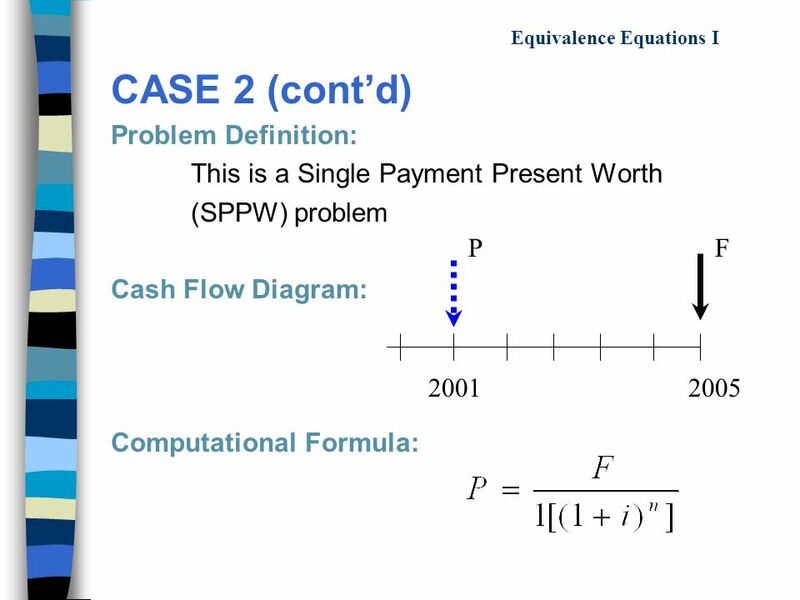 (c) 2002 Contemporary Engineering Economics 1 Chapter 4 Time Is Money Interest: The Cost of Money Economic Equivalence Development of Interest Formulas. 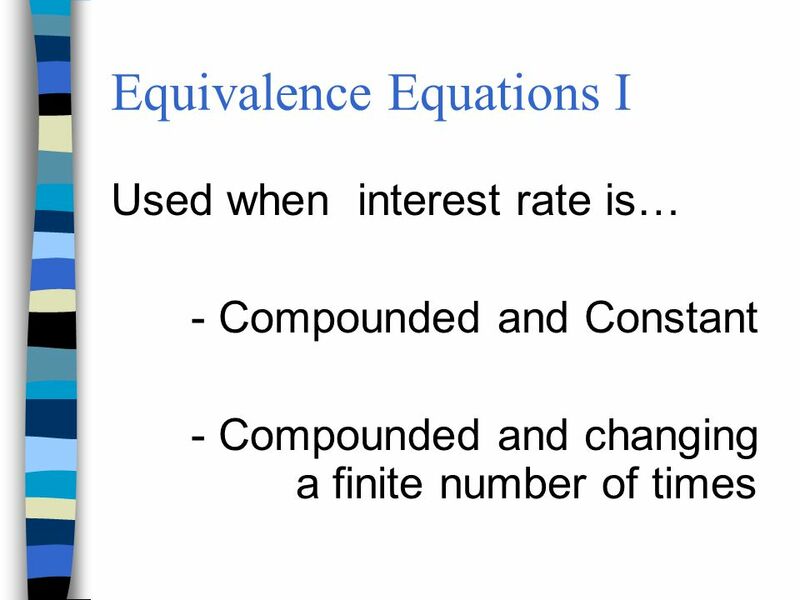 Recap of Previous Lecture Equivalence Equations Type I Interest rate is fixed or changes a finite number of times within the year Equivalence Equations. State University of New York WARNING All rights reserved. No part of the course materials used in the instruction of this course may be reproduced in any. 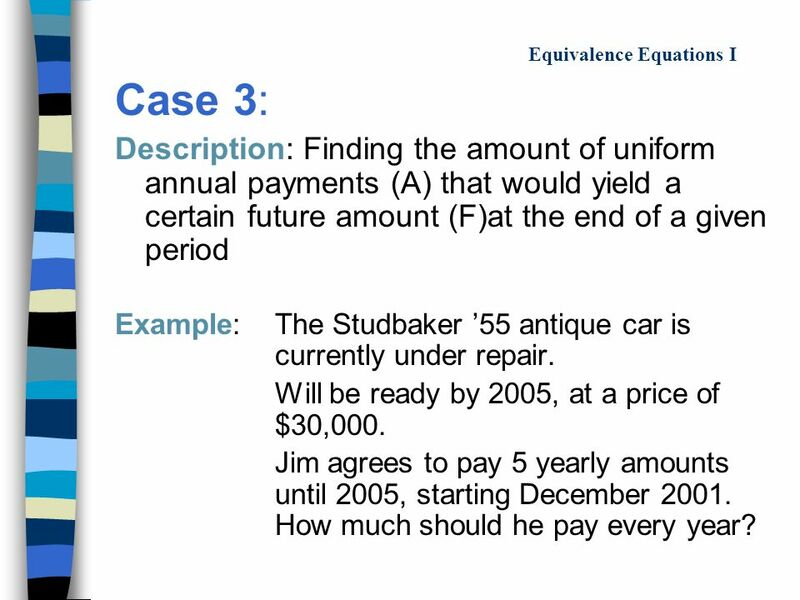 Module 3 ANNUITY Engr. Gerard Ang School of EECE.